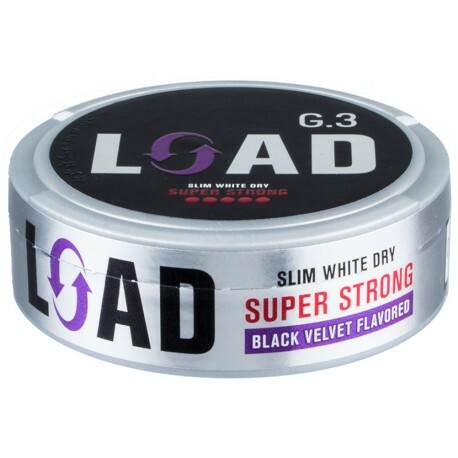 General G.3 Load Slim White Dry Super Strong Snus has a mellow and spicy tobacco taste with notes of licorice and eucalyptus, along with hints of anise, cocoa, and honey. In combination with 30% more nicotine and 20% less drip, this snus creates a long-lasting burning effect, a stinging “biting-under-the-lip” sensation. Sounds like quite a "load" even if I, Moe Unz, can't visualize the taste! General G.3 Load Slim White Dry Super Strong Snus contains 30% more nicotine than G.3 Extra Strong. Combined with the format Slim White Dry – 20% less drip than G.3 pouches in the Slim White format – it results in a SUPER STRONG product. I must tell you that I, Moe Unz, have no idea how Swedish Match came up with the name "Load". I also had nothing to do with choosing that name. Sounds like a very exciting snus though! You tell me! The flavor of this is very unique. The liquorice is not too overpowering with hints of cocoa, and it has a very very nice tingle in the lip which is something that really decides whether i continue to use it regularly or not for me. I use odens cold, thunder frosted lös, and g.3 wire mostly with some others here and there. This is a new regular snus for me. I usually dont like liquorice and i love this so dont be afraid to try it based on that. You will be missing out. All together great snus! This is a really delicious snus. The flavours are very much as described: mainly licorice with hints of cocoa and eucalyptus. The white portions are long and slim, and are very soft and comfortable under the lip. The nicotine hit comes on at about 5 minutes, but it won’t knock you over. It’s just a strong steady delivery. I find that I can easily have it in for 1-1.5 hours with very little drip. I didn’t think I would like it as much so now I need to order more! Actually this stuff is pretty good. Very soft portions, great nic content (like Wire) and the taste reminds me of the Swedish version of Sambuca.